See a special streaming of the Ronald Reagan feature film favorite SECRET SERVICE OF THE AIR. The Warner Archive Collection is also honoring Ronald Reagan with titles (listed below) that audiences might like to re-discover – titles that Reagan made with Warner Bros., the studio where he was under contract from the beginning of his screen career in 1937 until 1952. The first two movies of those listed below have previously been unavailable. They reveal a range that more than makes the case for a re-assessment of "Dutch's" pre-political career. STALLION ROAD (1947) This sentimental romantic drama for the horse-loving set was one of Ronald Reagan's favorite pictures. 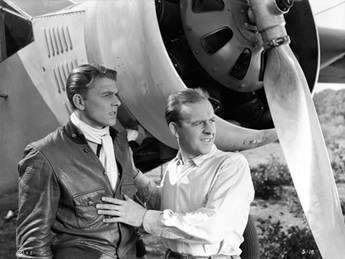 Reagan plays veterinarian Larry Hanrahan, an expert horse doc, who finds himself competing for the affections of a fellow equine aficionado (Alexis Smith)with his pal, a writer from the big city (played by Randolph Scott). NIGHT UNTO NIGHT (1949) Ronald Reagan stars as a stricken scientist in this metaphysical melodrama alongside the enchanting Viveca Lindfors. Diagnosed with epilepsy, biochemist John Galen (Reagan) moves to the Everglades in Florida to work in shame and isolation. He moves into a house owned by a widow (Lindfors) who is haunted by the voice of her dead husband. Together, they are forced to confront the mysteries of faith and fate. Directed by Don Siegel.